are extremely wonderful. One line extends vertically, the other horizontally. The vertical one pervades the ten directions. When the two lines are recited, they cause heavenly demons and those of outside ways to have no place to run, and they become very obedient. The power of just these two lines alone is inconceivable. OR ONE CAN HOLD THE ENTIRE MANTRA ONCE IN THE MORNING OR SIMPLY HOLD THE MANTRA HEART ONE HUNDRED EIGHT TIMES. IN THIS WAY ONE CAN STILL ATTAIN IMMEASURABLE BLESSINGS. When you recite the entire Shurangama Mantra once and the heart one hundred eight times, you will be able to obtain blessings that are measureless and boundless. That's why it's said, if you are able to recite the Shurangama Mantra, then in seven lives to come you'll have a reward of massive blessings and honor. That's if you're seeking blessings. If you want to seek to transcend the world, then you will also be able to obtain your aim. If you wish to seek these blessings of humans and gods, you will be able to obtain them. If you don't wish to seek for them, then you don't have to. This is the first part of the platform which consists of the syllables of the mantra. II) THE PLATFORM OF MENTAL CONSIDERATION: When you recite the heart of the mantra, you visualize the Sanskrit syllables. There are things that you don't need to understand. If you were to understand, then you would lose interest. If you don't understand, then you have a feeling there's some meaning in it, there's something you don't know yet. It's just like before we eat something, we always anticipate that it will taste good. But, after we've eaten it, we say, "Oh, it's just like that, and we lose interest. Cultivating the Way is also like this. If you do not know the meaning of the mantra--you do not know the meaning of the sy11ab1es--you always feel it's ineffably wonderful. If you recognize these words, you're apt not to pay attention to them anymore. Visualizing the Sanskrit syllables is like this as well, because we do not know what they mean. It's not like with your own native language, where you know that the word "big" just means big; the word "Bodhisattva" just means Bodhisattva. Of course, those who know Sanskrit will understand what these syllables mean, but those who have not studied Sanskrit will want to contemplate them. 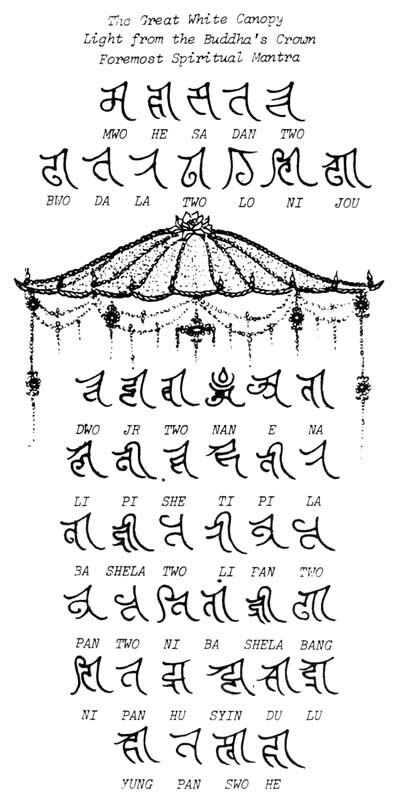 By contemplating these Sanskrit syllables you can obtain the five eyes and the six spiritual penetrations. You are able to contemplate these Sanskrit syllables one-by-one clearly, whether your eyes are open or closed. After some time, although you don't understand, the wonder of them will manifest, and you'll open your five eyes and obtain the six spiritual penetrations. Once you do this, you will understand causes and fathom effects. This is one of the methods of cultivating your mind. When you contemplate the Sanskrit syllables, your mind will not have any false thinking. You put each syllable in your heart and then with your eyes open and with your eyes closed you will see them clearly. After doing this for some time, you will have concentration, the power of Samadhi. ONLY THEN CAN ONE ACCOMPLISH SAMADHI. III. THE PLATFORM OF THE MUDRAS: AFTER THE CONTEMPLATION, ONE SHOULD BE CLEAR ABOUT THE MUDRAS. ACCORDING TO THE "RECITATION CEREMONIES OF THE ONE-WORD BUDDHA-SUMMIT WHEEL-KING," THE WHITE CANOPY BUDDHA-SUMMIT MUDRA IS MADE BY PLACING THE PADS OF THE THUMBS OVER THE NAILS OF THE RING FINGERS AND THEN PLACING YOUR HANDS TOGETHER WITH PALMS FACING. THE FIRST TWO FINGERS WILL BE SLIGHTLY BENT WHEN THEY COME TOGETHER: THE LITTLE FINGERS WILL COME TOGETHER VERTICALLY, AND THIS MAKES THE APPEARANCE OF THE MUDRA. MOREOVER, THE MANTRA OF THE WHITE-CANOPY-SUMMIT-WHEEL-KING MUDRA IS THE SAME AS THE FIVE-BUDDHAS-SUMMIT MUDRA, IN WHICH THE TWO PALMS ARE HOLLOW. THE VAJRA PALMS MUDRA IS LIKE FLOWER PETALS ON THE PALM. ONE NEED ONLY MAKE ANY ONE OF THESE THREE MURAS, AND IN THIS WAY ONE ACCOMPLISHES THE SHURANGAMA KING-WHITE-CANOPY BUDDHA-SUMMIT-HEART MANTRA MUDRA. UPON COMPLETING THIS MUDRA, ONE SHOULD RECITE THE MANTRA. TOGETHER THIS FORMS THE INTERACTION OF THE THREE SECRET PRACTICES. ONE WILL THEN BE ABLE TO ATTAIN THE THREE WHEELS, THE INCONCEIVABLE TRANSFORMATION OF ALL BUDDHAS. WHATEVER YOU SEEK, WHETHER WORLDLY OR TRANSCENDENTAL, WILL BE AS-YOU-WILL. III. THE PLATFORM OF THE MUDRAS: AFTER THE CONTEMPLATION, ONE SHOULD BE CLEAR ABOUT THE MUDRAS. After you know the platform of language and the platform of contemplation, you should understand the platform of the mudra. ACCORDING TO THE "RECITATION CEREMONIES OF THE ONE-WORD BUDDHA-SUMMIT WHEEL-KING," THE WHITE CANOPY BUDDHA-SUMMIT MUDRA IS MADE BY PLACING THE PADS OF THE THUMBS OVER THE NAILS OF THE RING FINGERS AND THEN PLACING YOUR HANDS TOGETHER WITH PALMS FACING. The pads of your two thumbs (above the first joint) are placed over the nails of your two ring fingers. The ring finger is also known as the "no-name finger." Then you put your hands together with palms facing, so the tips of your first, second, and little fingers touch each other. That's called "making the gesture of the mudra and reciting the mantra." What's it for? I'll te11 you something very important: it's just to make you pay attention. You're so involved in the logistics of it, you don't have any other false thoughts. There's no other meaning to it. It does not mean that once you strike this mudra, it will become efficacious. It is just to cause you not to have any other false thinking. If you do not have any false thinking, then even if you don't hold the mudra position, the Three Secret Practices will interact nonetheless. You should know the truth behind this. Why do we speak of the interaction of the Three Secret Practices--the "Platform of the Syllables of the Mantra, the Platform of the Mental Consideration, and the Platform of the Mudras"? It's all to keep you from having any other false thoughts. When you are single-minded, it is efficacious. When you are scattered, then you lose it. If you have one intention, then there can be a response. YOUR FIRST TWO FINGERS WILL BE SLIGHTLY BENT WHEN THEY COME TOGETHER. YOUR LITTLE FINGERS WILL COME TOGETHER VERTICALLY, AND THIS MAKES THE APPEARANCE OF THE MUDRA. After you place your thumb on your ring finger, your middle finger will join the middle finger on your hand, and your index finger joins the index finger on the other hand, and they will be slightly bent. The little finger joins together with the little finger of the other hand in a straight-up-and-down, vertical, position. This is the White-Canopy Buddha-Summit Mudra. There is another mudra called the Vajra Fist Mudra, which is quite simple. This is much easier, not as difficult as the last one. You place your thumb on the base of your ring finger, and then you close your fist. That's the Vajra Fist. All these samadhis arise from the Vajra Fist, the Vajra Palm, or the Varja Tying-up Hand. You can use either the Vajra Fist, or the Vajra Palm, or the Vajra Tying-up Hand. These three are very easy. You can use the Vajra Fist, but you should not glare at the same time. You can clench your fists together, but if you glare, then you'll be taken for "Ferocious Vajra Eyes!" MOREOVER, THE MANTRA OF THE WHITE-CANOPY-SUMMIT-WHEEL KING MUDRA IS THE SAME AS THE FIVE-BUDDHAS-SUMMIT MUDRA, IN WHICH THE TWO PALMS ARE HOLLOW. THE VAJRA PALMS IS LIKE FLOWER PETALS ON THE PALM. ONE NEED ONLY MAKE ANY ONE OF THESE THREE MUDRAS. Vajra Palm is made by entwining your fingers inside on your palms--spreading them out so they curl upward like the petals of a flower. By keeping your fingers intertwined and turning your palms down, you make the Vajra Typing-up Hand. 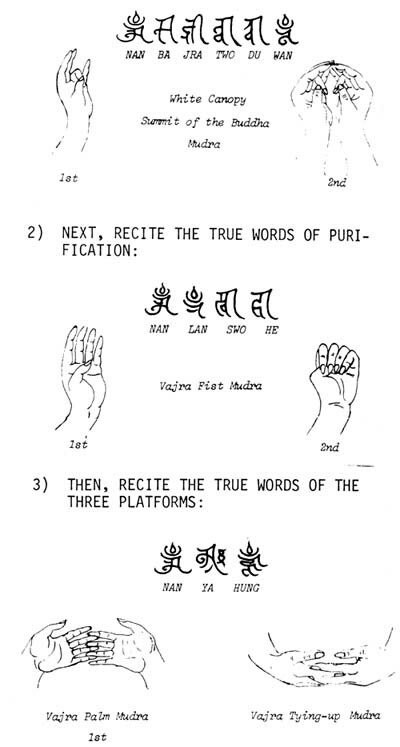 These are three mudras; you can use any one you please. When you recite the mantra, contemplate the Sanskrit words and assume the posture of the mudra--then the Three Platforms are in accord. IN THIS WAY ONE ACCOMPLISHES THE SHURANGAMA KING-WHITE CANOPY-BUDDHA SUMMIT-HEART MANTRA MUDRA. UPON COMPLETING THIS MUDRA, ONE SHOULD RECITE THE MANTRA. TOGETHER THIS FORMS THE INTERACTION OF THE THREE SECRET PRACTICES. ONE WILL THEN BE ABLE TO ATTAIN THE THREE WHEELS, THE INCONCEIVABLE TRANSFORMATIONS OF ALL BUDDHAS. The Three Wheels are your body, mouth, and mind, and they take on the inconceivable transformations of the Buddhas. WHATEVER YOU SEEK, WHETHER WORLDLY OR TRANSCENDENTAL, WILL BE AS-YOU-WILL. No matter what you seek, whether it's worldly or world transcending, you will be able to obtain it. But, the best is not to seek. If you are seeking something, then you have a mind of greed. If you are greedy, you may get some apparent results, but you won't obtain limitless merit and virtue. If you do not seek, then your merit and virtue will be extremely great. THE THREE MANTRAS OF THE SECRET DIVISION: If you do not know what's just been explained, then as an alternative, you could use the Three Mantras of the Secret School. Reciting this, you will also be able to establish a platform. 1) FIRST RECITE THE TRUE WORDS OF THE DHARMA REALM: NAN. WA DZ LA TOU DU WAN. 2) NEXT. RECITE THE TRUE WORDS OF PURIFICATION: NAN. LAN SWO HE. 3) LAST, RECITE THE TRUE WORDS OF THE THREE PLATFORMS: NAN. YA HUNG. These three platforms are the Buddha Platform, the Dharma Platform, and the Sangha Platform. This mantra is recited in the "ceremony for liberating lone or homeless spirits and demons." "NAN" represents Vairochana atop the crown of the head and is the Buddha Platform. "YA" is Amitabha Buddha. "HUNG" is Akshobhya Buddha. Amitabha Buddha is the Dharma Platform, and Akshobhya is the Sangha Platform. These are the Three Platforms. Once you recite these mantras, the Three Platforms are in accord. So, another good method is to recite these three mantras prior to reciting the Shurangama Mantra. The first one is purifying the Dharma realm True Words, and it clears up the Dharma realm. It is: NAN. WA DZ LA TOU DU WAN. You recite it seven times. The second is NAN LAN SO HE. You also recite it seven times. The third is NAN YA HUNG. You also recite this one seven times. When you recite these three mantras seven times each, there will be an interaction of the Three Secret Practices. NAMO SHURANGAMA ASSEMBLY OF BUDDHAS AND BODHISATTVAS. Before you recite the Mantra, you should return your life to the Shurangama Assembly of Buddhas and Bodhisattvas by reciting this line three times.